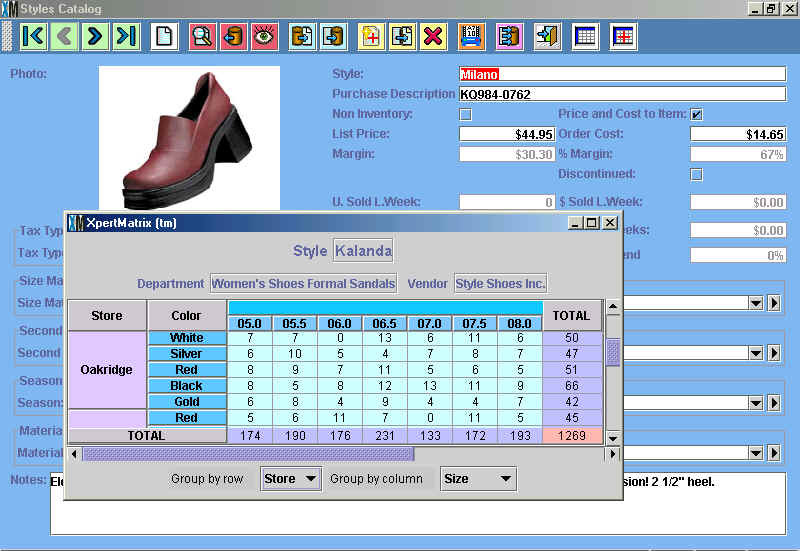 For any shoe or clothing retailer, an essential function of a POS & Inventory Control system is the ability to display stock levels for each style in a matrix of size and color. On top of these basic dimensions, XpertMartTM adds two more: second size and stores. By pressing a button, the view can be changed for each axis of the matrix to see, for example, stock levels in each store grouped by color, or stock levels for each store grouped by store. Total quantities appear fixed on the right side and lower part of the screen so that this vital information can always be seen no matter how large the matrix.